Just like craft beer drinkers, many hard cider drinkers want to know where their beverages’ ingredients are grown and enjoy learning more about the flavor profile, meaning the apple varieties used in the beverage. “People like local,” said Benji Deal, who has made hard cider for nearly 10 years. Along with traditional hard cider, Deal’s Orchard of Jefferson sells hard cider in raspberry, peach and pear flavors. 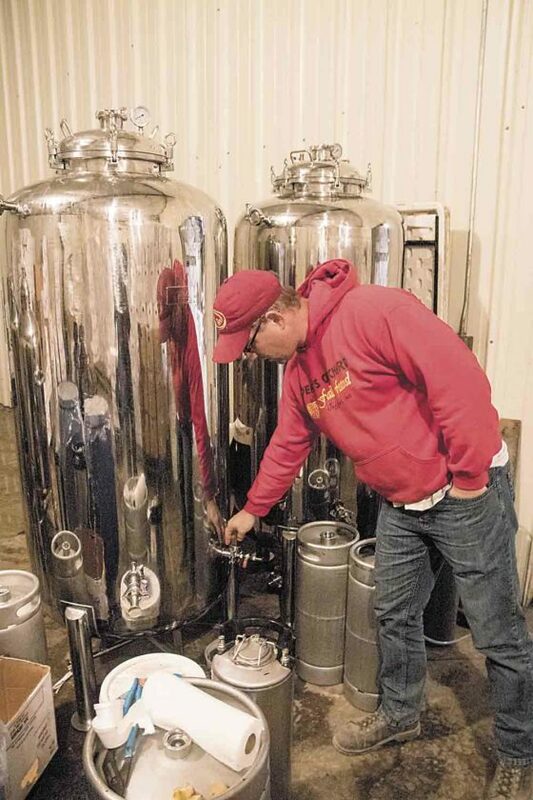 While making hard cider is similar to fermenting wine, with the process occurring in 170-gallon stainless steel tanks, cider doesn’t need to age, said Benji Deal, who is shown here checking on the tanks. JEFFERSON — What started out as a Christmas gift in 2009 for home winemaking has blossomed into a whole new business at Deal’s Orchard, thanks to Benji Deal’s passion for brewing hard cider. 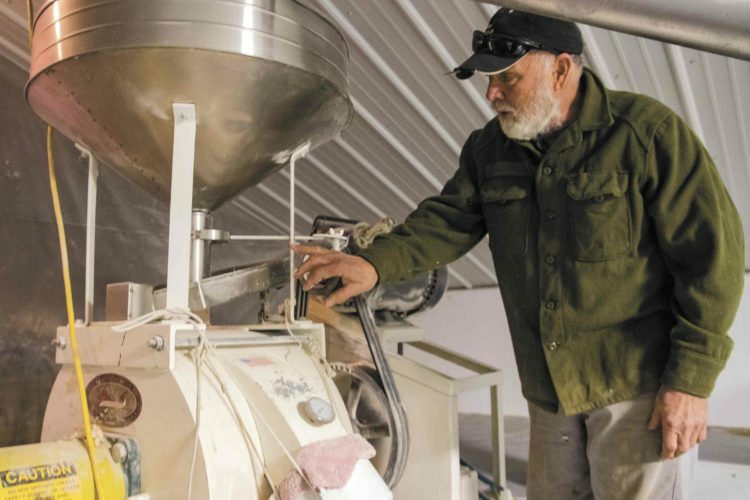 “We had a bigger crop of apples in 2009 and decided to experiment with making hard cider,” said Deal, 40, who is part of the fourth generation of his family to run their apple orchard and agri-tourism operation west of Jefferson. The Deals made 120 gallons of cider that first year and shared it with family and friends. 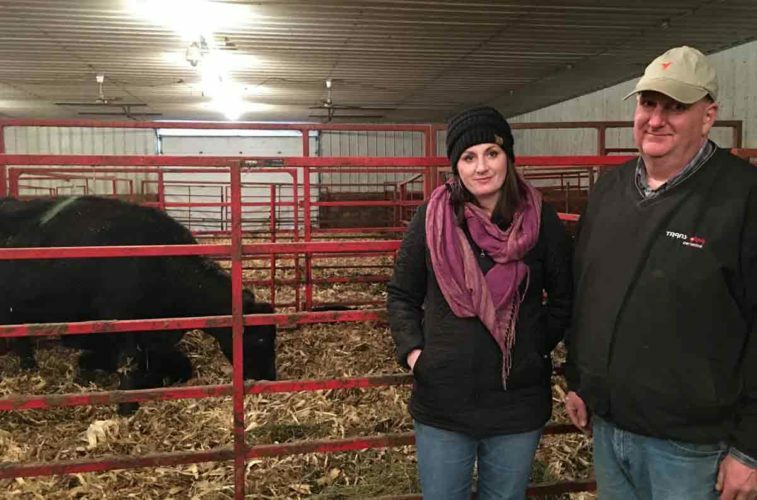 “People seemed to like it, so we decided to expand,” said Deal, who completed the paperwork in 2011 to register as a native winery with the state of Iowa so he could ferment hard cider for commercial production. 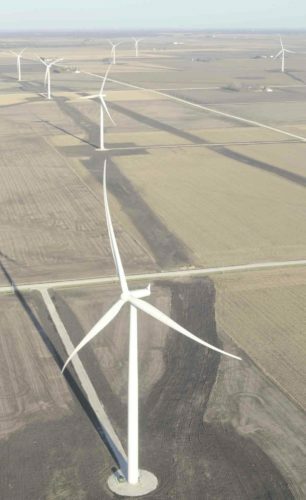 Turns out this former high school math teacher’s business instincts were right on target. 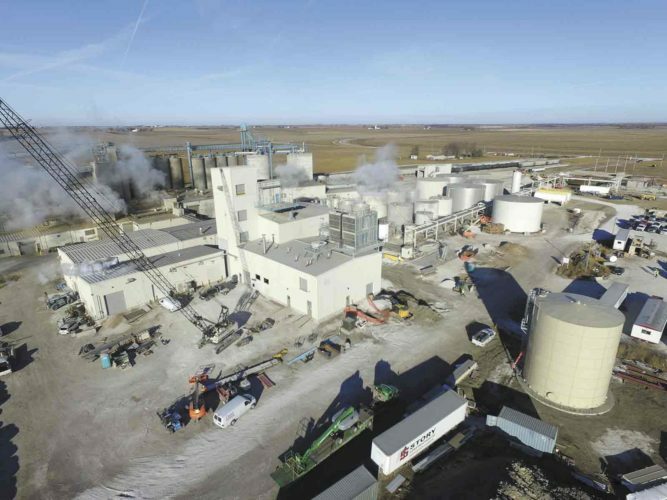 Deal’s Orchard became one of the first hard cider producers in Iowa and is part of a beverage trend that’s sweeping America. The U.S. cider market is predicted to grow 12 percent up to 2020, according to Wine & Craft Beverage News. Interest in cider has piggybacked on both the craft beer and foodie trends, in which more consumers are devoting a considerable amount of time, effort and dollars to seek out new, interesting and local flavors. While hard apple cider might be the hot new trend in beverages, hard cider’s roots run deep in American history. When English colonists first arrived in North America, they embraced the wide range of fruits they found, including wild, bitter apples that could be fermented into a dry (less sweet) cider, Deal said. Colonists also planted apple orchards. Many were so bountiful that most farmers ended up with far more apples than they could eat. By fermenting these apples into hard cider, the colonists created a tasty drink that would remain fresh and usable much longer than the raw fruit. Hard cider also offered a safe alternative to frequently suspect colonial drinking water supplies. “Hard cider was the main beverage of colonial America,” Deal said. Cider’s popularity began to wane by the late 1800s and early 1900s, though, as huge numbers of German and eastern European immigrants brought with them a penchant for beer over cider. Westward migration and the settlement of farms across America also meant that barley was easier to grow in some parts of the country compared to New England. As a result, domestic beer production became easier than it had been in colonial America. The advent of mechanical refrigeration also improved the quality of beer year-round. If that weren’t enough, along came Prohibition in 1920, which dealt a devastating blow to hard cider. Fast forward to the 2010s, when the resurgence of local breweries gained momentum, propelling production and demand for both craft beer and hard cider. Hard cider has proven to be the world’s fastest growing beverage category in the last 10 years. Additionally, hard cider is the fastest growing segment of the craft beverage market, according to Carla Snyder, a Pennsylvania State University agricultural entrepreneurship and marketing educator who was quoted as saying in a July 2016 article in Wine & Craft Beverage News. Just like craft beer drinkers, many hard cider drinkers want to know where their beverages’ ingredients are grown, and enjoy learning more about the flavor profile — meaning the apple varieties used in the beverage. Deal’s Orchard uses the juice from a variety of sweet to tart apples to create both its hard cider and its sweet cider. 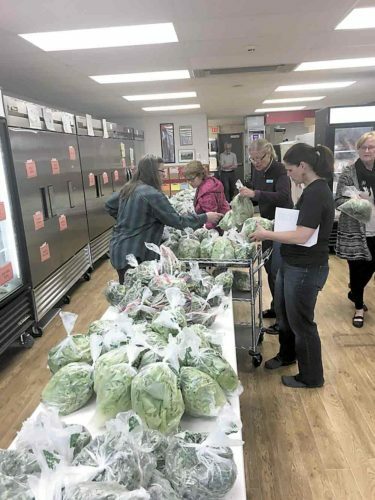 “We often take our regular cider and ferment it into hard cider,” said Deal, who aims for an alcohol content of 6.9 percent in the hard cider. Hard cider drinkers seek out the tannins and bitter notes that tend to come from heritage apple varieties, rather than sweeter dessert apples that are used for fresh consumption. Who’s a typical hard cider drinker? Compared to average beer drinkers, cider consumers are younger (many are in the 21 to 40 age range), earn a higher income and are more likely to be Hispanic, according to data shared at the 2017 United States Association of Cider Makers’ annual convention in Chicago. Hard cider drinkers are also more closely gender-balanced, meaning men and women tend to favor hard cider equally, compared to beer drinkers, who tend to be male. What started with 120 gallons of hard cider production at Deal’s Orchard has now increased to 1,500 to 2,000 gallons a year. 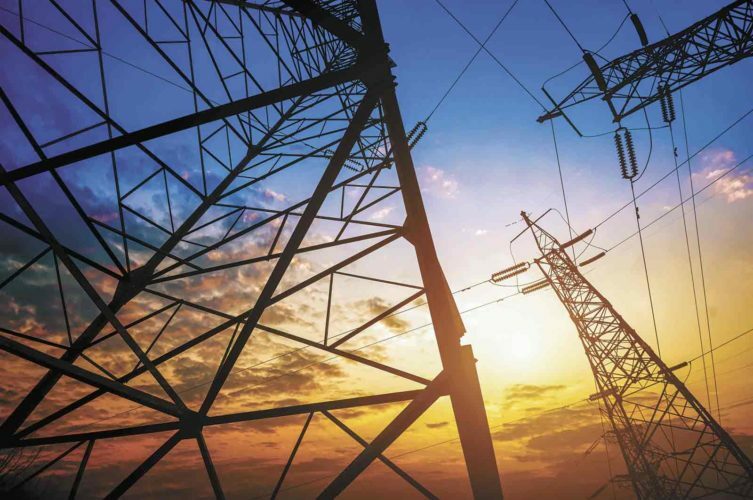 “While this growth is sizeable, we’re still a small producer,” Deal said. He noted that it takes 30 to 40 apples to make a gallon of cider, and Deal’s presses about 35,000 gallons of total cider a year. While making hard cider is similar to fermenting wine, with the process occurring in 170-gallon stainless steel tanks, cider doesn’t need to age. Cider can also take on various flavor profiles beyond apple. 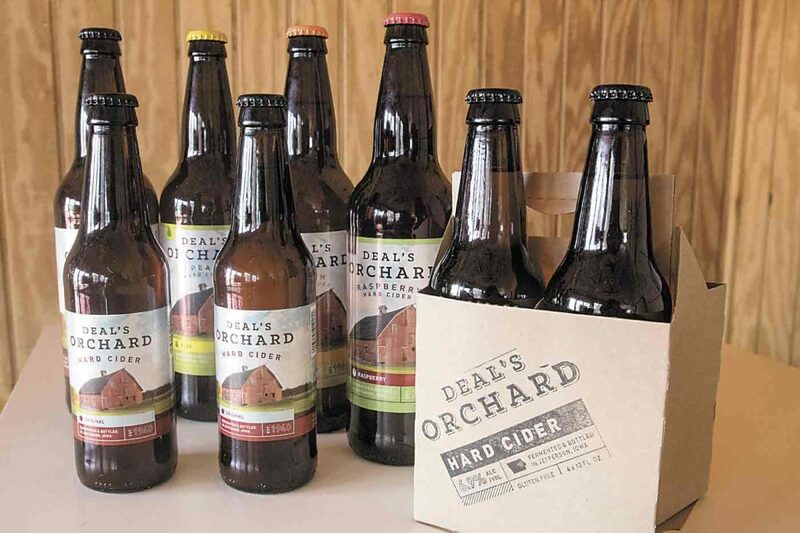 Along with traditional hard cider, Deal’s Orchard sells hard cider in raspberry, peach and pear flavors. Sales are growing of flavored hard ciders, which represent 16 percent of overall cider sales, according to data shared at the 2017 United States Association of Cider Makers’ annual convention. 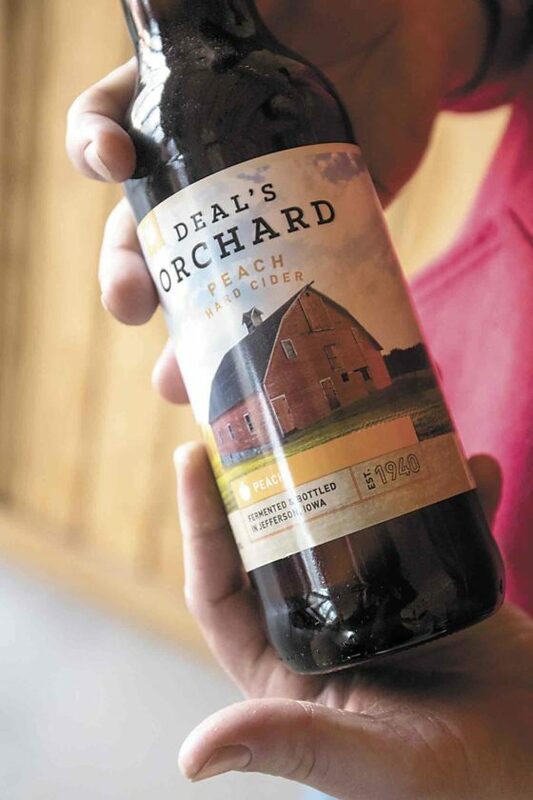 Customers can purchase hard cider from Deal’s Orchard at the orchard near Jefferson, some area grocery stores (including Hy-Vee and Fareway), and at a variety of locations in the Des Moines metro area, including the Iowa Tap Room, El Bait Shop and 515 Brewing Company in Clive. Deal looks forward to growing his hard cider operation.